Phil Madeira is a man who many, many people know but may have never heard of… excuse the conflict in that sentence, but here we have a man who has been a behind-the-scenes writer, player and producer for the likes of Alison Krauss, Old Crow Medicine Show, Keb’ Mo’, Mavis Staples, and many more. He is also a band member for Emmylou Harris’s Red Dirt Boys…on top of all of that he can turn his hand to guitar (electric/acoustic/dobro/lap steel), piano, B3 and the accordion and in the process make a wannabe musician like me insanely jealous! Born in Rhode Island to a minister father and church pianist mother meant music was always going to be part of his life. Moving to Indiana to study art, he continued his writing and playing and it was here that he met the guitarist Phil Keaggy and joined his band in 1976. That was short-lived and so five years later he made the move to the musical capital that is Nashville. It didn’t take long to establish himself and he quickly became an in demand session musician and producer…his last releases were two volumes of faith-based songs called Mercyland: Hymns for the Rest of Us, sung by several of his famous friends. 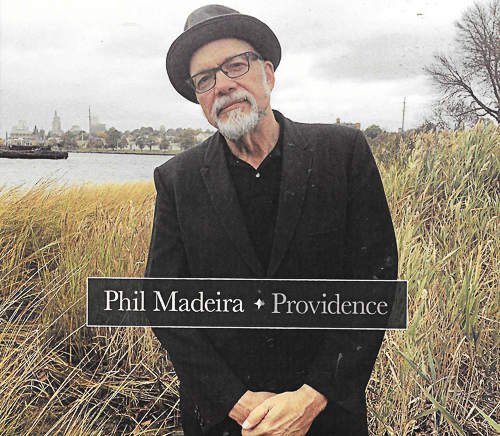 However, his newest album Providence is totally different to those, and to most of his output in fact… it isn’t faith based particularly; it isn’t country, Americana or blues. What he has delivered is a piano-based jazz-infused collection of semi-autobiographical songs all about his home state and town…hence the name. Predominately built around a trio of Madeira on piano and Red Dirt Boys Chris Donohue on upright bass and Bryan Owens on drums it features ten original songs and welcomes some big name guests as we are invited to join his journey from Providence to Nashville. Opener, Wicked Job, tells of his time working as a shelf stacker while dreaming of becoming a musician. It is told over rolling piano and a lovely bass and clever drums. It is also a lesson in how to tell a relatively mundane story (microwaves and toasters anyone?!) in an entertaining way. The jazz inflections are there but it holds a structure throughout, even through what could be interpreted as an ad-lib piano solo. A Rhode Island Yankee on Jefferson Davis Court is about his move to Nashville again delivered over a loose jazz beat with horns punctuating and a guitar providing additional depth, and I think Mark Twain would approve of the title too. Dearest Companion connects Nashville and Rhode Island and has the bass rumbling over brushed drums as Madeira serenades across the piano. The melody is not really original but it still fits with the lilting tone of the song as a whole. Back In The Ocean State is pure jazz lounge material with an undeniable happiness in the music even though he “spent a year scraping barnacles off a wooden hull”. The brass is just as happy as it joins in and is even allowed the odd error. Barrington refers to his childhood and is slower and more reflective because of the subject. It has a sadness to it as his voice takes on a Randy Newman tonality while a simple bass and brushed drums over a sparse piano increase the melancholy. Crescent Park is another hometown allusion and has the significant talent of John Schofield on guitar. This is an upbeat jazzy track made great by Schofield’s fluid playing as, after a clever piano solo rom Madeira, he adds a real touch of class with some inspired playing. Rich Man’s Town brings Ramsay Lewis to mind in the way the horns burn away in the background. Wide Eyed Dream is a burbling jazz out of the late 50s and sounds great, especially as we get a short but sweet solo from that fine sounding upright bass. Native Son is a bit of a different beast from the rest with its slow pace to both lyric and music. It does have the lovely well placed and well-paced guitar highlights from Will Kimbrough to keep it from descending too far into melancholy. The final track, Gothenburg, has Madeira singing over a mournful piano and string arrangement about his grandfather’s emigration from Sweden to America. It is a powerful song and carries a powerful message although it isn’t an easy listen with the purposely-hesitant chords and melody. So here we have a jazzy Americana blend of an excellent musician’s journey through life. It isn’t my normal fare by any means but, with a couple of exceptions, it is an enjoyable trip with stories well told in words and in a unique take on the jazz genre. Recorded at Sound Emporium Studios in Nashville.